The white Cima 113” 16:10 Presentation Format Above Ceiling Projection Screen from Stewart Filmscreen is designed to be compatible even with the next-generation 4k capable projectors to display pictures with vibrant colors, sharper contrast, and rich detail in Ultra HD resolution. The screen’s large 113” display area lets you enjoy images and videos in 16:10 presentation format. Made of Stewart Filmscreen’s Neve material, the projection screen is suitable for use in environments with good lighting control. Neve also minimizes the appearance of cross-reflection and other potential artifacts at the outer edges of the viewing cone. In addition, the screen boasts a low gain of 1.1, which ensures even light diffusion for uniform reflection over the entire viewing area. This eliminates the concentration of reflective output towards the center, so the projected images are uniformly sharp and detailed even at the edges of the screen. Moreover, the view is equally bright from the corner seats as well, thanks to the screen’s half gain viewing angle of over 80°. The Tab-Guy tensioning system and consistent material uniformity ensures a smooth and completely flat screen surface, eliminating any edge curl. Thanks to the matte black overscan borders that allow for appropriate masking, the projected image appears to bleed-off the screen for professional looking presentations. This means that the audience perceives the projected image to be brighter, sharper, and of higher contrast. 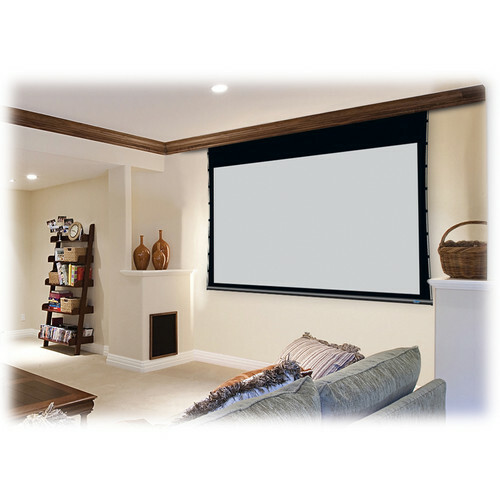 Moreover, to achieve the desired viewing height of the projected image, the screen also comes with a 12” black drop. You can conveniently roll down the screen during presentations and neatly roll it up when you’re done at the push of a button. The rolled-up screen and the motor are housed in a compact white aluminum extrusion case, which can be flush mounted into a ceiling, reducing installation space and allowing for a clean finish. Apart from being mildew resistant and washable, the screen is also flame retardant. Moreover, this environment-friendly projection screen is GREENGUARD certified, which means that it is made of materials that have low chemical emissions. Note: The gain is measured in accordance with SMPTE RP 94-2000. Resistance to fire is based on NFPA 701 Standard Methods of Fire Tests for Flame Propagation of Textiles and Films. 113" display area with an image size of 116 x 72.5"
The case is recessed into the ceiling after mounting and remains hidden from view.